They say you learn something new everyday and yesterday when someone mentioned Dandelion Jam (or Confiture Aux Fleurs De Pissenlits) I realised that my moment for the day had come. 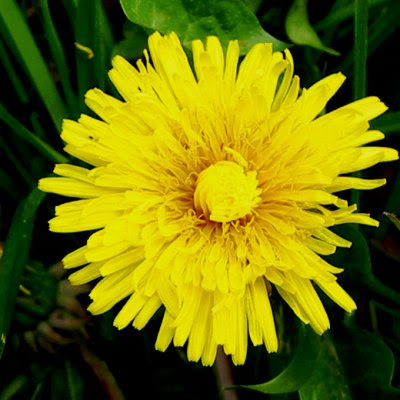 Dandelion wine was well known to me but I'd never heard of Dandelion Jam in my entire life. Looking on the web I discovered I was probably the last to hear, there were many places with recipes for this new delicacy, sadly most of them copied from each other and few with any actual comments about the finished product. I am always suspicious of "country" recipes which call for a lot of citrus and sugar. Citrus and sugar make almost anything palatable and can hardly be called local cooking ingredients. Finally, there is no way that the ingredients as listed would ever create anything remotely resembling jam or jelly, there is nothing to make the liquor set. The best that might happen after the hour long boiling recommended would be a rather sticky thick syrup and by then any of the lighter flower perfumes would surely be lost. Then I discovered this site written by a man who is a real enthusiast. When I stopped skimming his fascinating articles I found the recipe for Dandelion Syrup and was pleased to discover that his Grandmother used no oranges at all. She still used an inordinate amount of refined sugar but I suppose I should stop the guilt about that now. After all, I'm still taking three cubes in my morning coffee. Pick two litres by volume of lovely yellow dandelion heads, nipped off just behind the flower so you take no stalk. Leave for an hour or so to allow the tiny beetles time to make their escape, then use scissors to trim the yellow petals into a bowl. It doesn't matter if some little bits of green fall into the pile but make sure there are no lumpy bits of flower base or stalk there. From my flowers I collected 50g of petals. You don't need to wash the flowers if you've picked them from a clean field and if you didn't I doubt any amount of washing would put things right. Put your petals in a large saucepan and cover with water. I was surprised that 1.5 litres seemed about right for this. You might try using just 1 litre for a more concentrated flavour. Chop up one well washed and ideally unwaxed orange, skin and all, into small pieces and add to the pot. Bring everything up to simmering temperature, keep on the heat for a minute then turn off the cooker, cover the pot and put the mixture to steep somewhere cool overnight. Next day, strain off the liquid, pressing the residue well to collect the last drops of the precious juice. At this point I found I had about 1.2 litres. Rinse out your saucepan and put the dandelion juice back into it with the juice of one lemon and 1 kg. of sugar. This amount is part way between the amount recommended by François-Xavier's Grannie and the much copied about recipe on the web. So what's it like? As you might imagine it's rather delicately flavoured and very sweet but pleasant and flowery. Diluted with about four times its volume of water it makes a nice drink for a spring afternoon, I can imagine it in a white wine for a spring Kir and a spoonful from the bottle might soothe a sore throat. Next year, perhaps, I'll use a little more lemon juice and some pectinated sugar and see if it can be set as a jelly. It would be divine in little pastry cases decorated with spring flowers. But that's for anther time. So how much piss did it induce? I can't say I've noticed any excessive effects but to be honest the active ingredient in 50g of dandelion petals must be approaching homeopathic quantities in a litre and a half of syrup. Maybe you have to eat the leaves to increase the flow. I'm british. My agenda is sniggering. This is a lovely recipe. Congratulations. It is also nice made with half white sugar half muscovado sugar. Then it is great on pancakes English or American. I believe that you are supposed to store the confiture upside down even when using.